So hold within your hands the deck of Daily Life Playing Cards, which therewith lingers your warmth, and dance with a splash of colors with your cardistry. Which may fraught with hardship and distress. But there are also moments that abound with glittering joy. Beneath the prideful heart that is the King's, lies a humble adoration for his beloved Queen, and a modest pursuit for their collection of swords. And beyond the nurturing elegance of the Queen, dwells a ravenous hunger to possess everything beautiful. The Jack too, albeit looking ordinary and loyal as a servant, shoulders upon himself a lifelong dream as a celebrated poet, for which he composes every day. What about your Daily Life?" Printed in classic stock by United States Playing Cards Company. The designs are fully customized for every card. 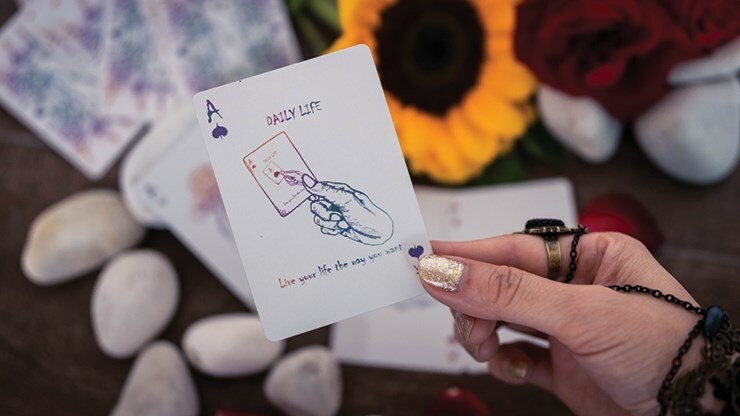 The Daily Life Playing Cards is a deck created by Austin Ho. It's produced by "Skymember Presents" from Malaysia, and is their fifth deck. 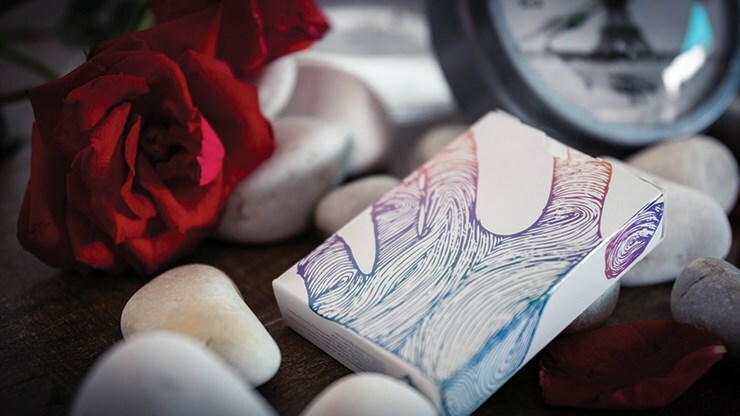 Austin Ho invites you to explore his deck with a description that is full of poetry, and this artsy and poetic feel is immediately at home in the world of card flourishing. The cover is a clever tribute to this concept, with a small image of the deck itself on one side, and the other the outline of the artist's hand grasping the deck: two perspectives of the same thing. The card backs feature two clasped hands, along with a two-way design that integrates a variety of icons having to do with playing cards and art. If you look closely, you'll see suit pips, and also some artists tools. The colours used on the card backs (and throughout the deck) are particularly interesting. They remind me of scratch art, although that normally has a black background whereas here the white background gives a very different feel. 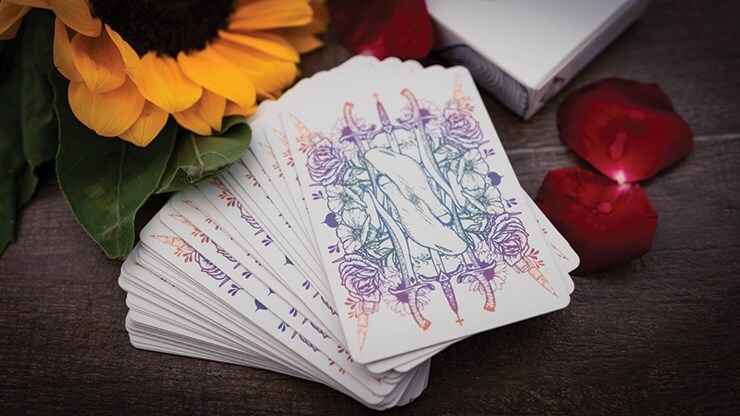 Hands and art are a recurring theme in this deck, and the art for the entire deck has been hand drawn, and then digitized from pencil type sketches. 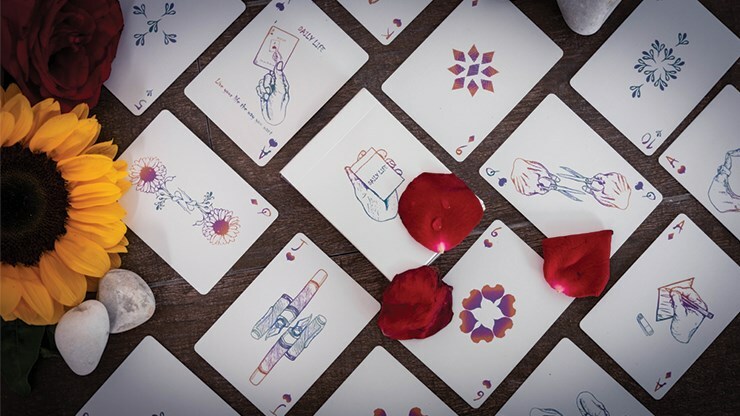 The Aces all feature hands - holding a playing card, drawing, cutting a flower, or making a heart shape. 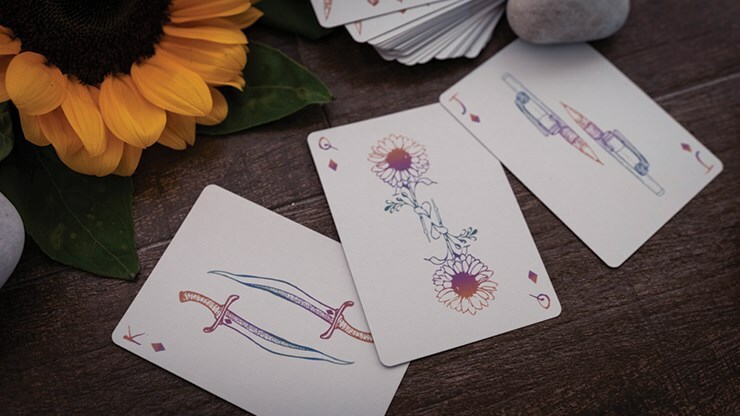 Austin has taken a very interesting approach to the court cards, by making the usual objects that traditionally accompanying our characters as the feature piece. For the kings we have swords, for queens we have flowers, and for the jacks we have the pens and pencils of the artist himself. The pips are all hand drawn, and I especially like the custom arrangement of these on the number cards, where they make a mosaic shape in the center of the card, and ensuring lots of white space around them, for a very creative effect. Perhaps all this white also represents something about the blank canvas that an artist usually begins with. You can also use all the white space on the card faces to your advantage in combination with the blank faced gaff that comes with the deck; it's easy to do a reverse fan and create the illusion that the entire deck is blank, as you'll see performed in the official trailer. 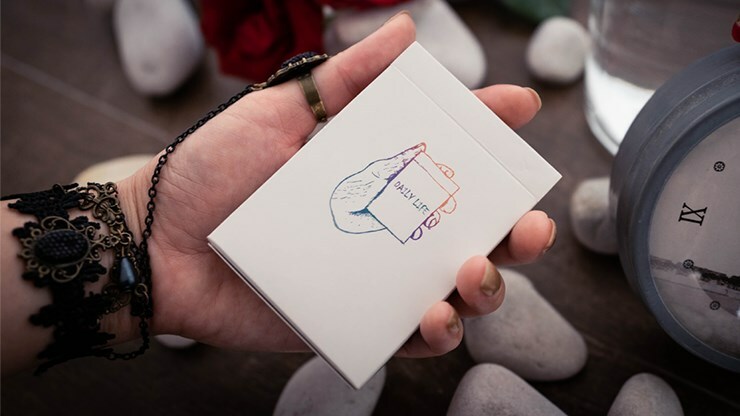 Besides the blank-faced card, the extra cards that come with this deck include two with empty hands (front and back), and another with a hand holding a two of diamonds. This can be used as a great card reveal, and you'll see a nice use of this in the official trailer. Printing by USPCC also ensures that this deck has the handling that cardists look for.